A war hero delivers a final, mournful series of remembrances just as his memories begin to scatter. The title of this striking and slippery late novel by Tabucchi (Time Ages in a Hurry, 2015, etc.) gives away the ending, but even so the somber opening pages leave little doubt to the story’s trajectory. Tristano is at the end of his life, one leg ravaged with gangrene, and he’s summoned a writer who’s reimagined his life in a novel to set the record straight. The novel depicted Tristano’s moment of heroism during World War II—as an Italian soldier stationed in Greece, he killed a Nazi soldier who murdered an innocent woman and child, then hid in the mountains with Greek partisans. Tabucchi has his protagonist struggle to recall his story, thinking of the women he loved, questioning his heroism, and bemoaning the infirmity of the truth. “Life isn’t arranged in alphabetical order,” he laments, and to echo that point, Tabucchi’s tale is digressive and sometimes frustratingly abstract. 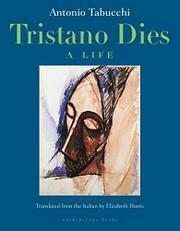 But if the overall narrative is splintered, Tristano’s philosophizing is oak-solid, engaging, and often black-humored. He riffs often on the flexibility of history and who gets to write it, the cruelty of war and the atomic bomb, selective memory, mental illness, and betrayal. “At times it’s so hard to tell the difference between cruelty and justice…killing…or murdering,” he intones as he shades toward a late confession. The incompleteness of the story, its distance from objective truth, is part of Tabucchi’s narrative strategy, prompting the reader to consider what kind of information we need to assign somebody the title of hero. Tristano is a great admirer of Borges, and this book evokes his wordplay as well as his eagerness to manipulate time and storytelling like taffy. An admirable if challenging reworking of the overworked themes of war-hero tales.